With the Goliaths of virtual world locking their horns in a war of supremacy for global social networking services (read: Google and Facebook) some regional players seem to be ready to change track rather than fight their own battle. One of India's largest media and entertainment companies Reliance Entertainment announced to members of its social networking and blogging site Bigadda.com that it is shutting down its social networking platform and moulding into an e-commerce site. An e-mail sent to its users reads, "We value and appreciate your long standing support for Bigadda.com. In the past few months we explored our potential as an ecommerce portal by providing branded products at profitable deals to you and have found immense success. We are reaching newer heights everyday and hence are planning an expansion in the same arena. We request you to download all your personal collection of blogs, audio files, video files and images from Bigadda.com as we are scaling down our Social Networking services. Please note that all your old personal data, uploaded on Bigadda.com, shall not be available after July 15 2011." When Bigadda launched in May 2007, Mashable called the "Indian MySpace.com". The site began with 6 lakh users as of October 2007 and the plan was to reach 10 million by 2010. In March this year, the company decided to shift away from social networking to e-commerce and set up Shop.Bigadda.com. 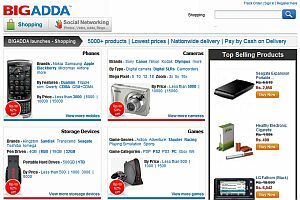 Now, Bigadda.com leads to Shop.bigadda.com as well as the landing page for social networking which includes Photos, Videos, Blogs, Addas (groups) and Classifieds (powered by Quikr). Elaborating on the reasons behind the decision, Rohit Sharma, CEO (Digital) at Reliance Entertainment said, "Facebook is growing very fast, so we decided to modify Bigadda into an e-commerce destination. Local social networks will not be able to grow in India. We believe that social networking is by virtue a business driven by communities and Facebook is ruling the roost in India." Is this a death blow to local social networking? Other Indian social networking sites include Minglebox.com, Fropper.com, Bharatstudent.com and IndyaRocks.com. For more details on the strategy behind Bigadda's transformation, stay tuned to Techcircle.in. We will bring you more tomorrow followed by a detailed interview with Sharma on the current status of Zapak, True Games, movie rentals and streaming business BIGFlix and Reliance Entertainment's digital plans later this week.